Borussia Dortmund star Christian Pulisic scored a second-half brace as the United States Men's National Team beat Trinidad and Tobago 2-0 in FIFA 2018 World Cup qualifying. Pulisic was the star of the show in Denver, Colorado, as his strikes in the 52nd and 62nd minute lifted the USMNT to third place in North, Central America and Caribbean qualifying. At just 18 years of age, the Dortmund sensation is emerging as potentially the most important American player in a generation, and his performance against Trinidad and Tobago will have done little to calm the hype surrounding him across the pond. Pulisic's brace means the US are back on track after drawing with Panama in March, but they now face a daunting trip to Mexico City to face group leaders Mexico, who were able to leave Bayer Leverkusen's Chicharito and Eintracht Frankfurt's Marco Fabian on the bench as they eased to a 3-0 win over Honduras. "It's going to be a tough one down there in Mexico," Pulisic admitted. "But we really want some revenge on them from when they got us earlier this year. So we're really confident going into that game, and we're going to come out with a win there too." Back in November, Mexico edged the US 2-1 in Columbus to make a perfect start to CONCACAF qualifying, where the top three of six teams will advance directly to the 2018 World Cup, with fourth place settling for a play-off against the fifth-best team from Asia. "These games are tough," said American coach Bruce Arena. "And to walk away with three points and two goals, we've started off 2017 in pretty good shape. I'm pleased at this point." Future Wolfsburg signing John Anthony Brooks and Borussia Mönchengladbach's Fabian Johnson also started for the USMNT, while Hamburg's Bobby Wood came on as a late substitute. With five of ten games played, Mexico lead the group on 13 points, ahead of Costa Rica on eight points and the USA on seven. 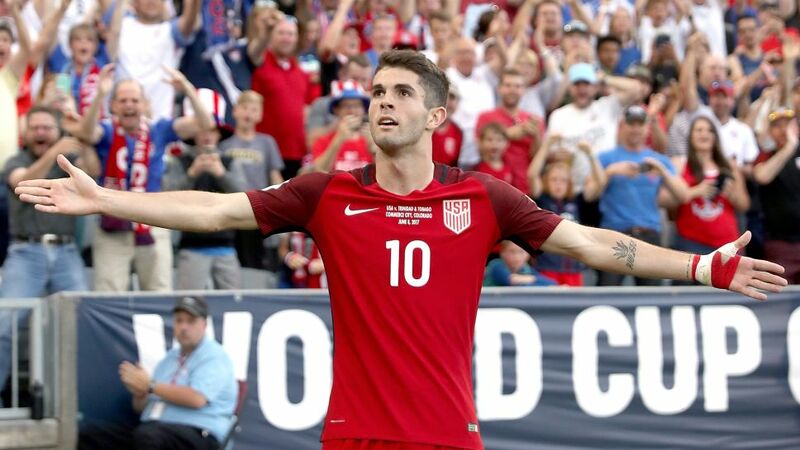 Pulisic now has seven goals in 15 USMNT appearances, including five in eight World Cup qualifiers.The Dortmund starlet scored the second brace of his international career, after netting twice in a 6-0 win over St. Vincent and the Grenadines in September 2016.Pulisic has scored four goals in his last four games for the US.